[Anne Lister’s Diary, p. 175 ‘The Secret Diaries of Miss Anne Lister” (Virago, ed. Helena Whitbread)]. Reading Anne Lister’s diaries was my first glimpse of debtors’ prison inmates knitting to make a little extra money. Being in debtors’ prison was not free of charge. You could improve your food and accommodation – so long as you paid. Debtors would knit small items like night-caps,purses and stockings, and sell them to members of the public to make their lives more bearable. Many jails had two sides – one for criminals, one for debtors. I have seen the nineteenth century York Castle jailer’s journal, where he records the location of burials of the executed prisoners. Under the paving slabs of this very yard. Anne and her aunt will have stepped on them to buy their night-caps. The best source to give a glimpse into the 19thC debtors’ prison is Dickens’ ‘Little Dorrit’ – Dickens was no stranger to the sometimes bizarre interior world of the debtors’ gaol, thanks to his father’s time in the Marshalsea, in 1824. Read that for more insight than I could ever give you. LANCASTER CASTLE. During the late assizes, the high sheriff gave an order to the governor of Lancaster castle, not to admit strangers within the walls of the debtors’ side… on the ground that the indiscriminate visits …during the assizes, might possibly introduce disease into the gaol. This was considered a great hardship by the debtors, as they had been accustomed to reap a pretty good harvest during the previous assizes, by the sale of articles of knitting, &c., such as purses, night-caps and other articles, which they manufacture during their imprisonment. The high sheriff was memorialised on the subject by the disappointed debtors, but in vain; the prohibition was not taken off until the assizes had terminated, and most of the visitors had left town. [The Manchester Times and Gazette, Saturday, March 31st, 1832]. Clifford’s Tower, York. 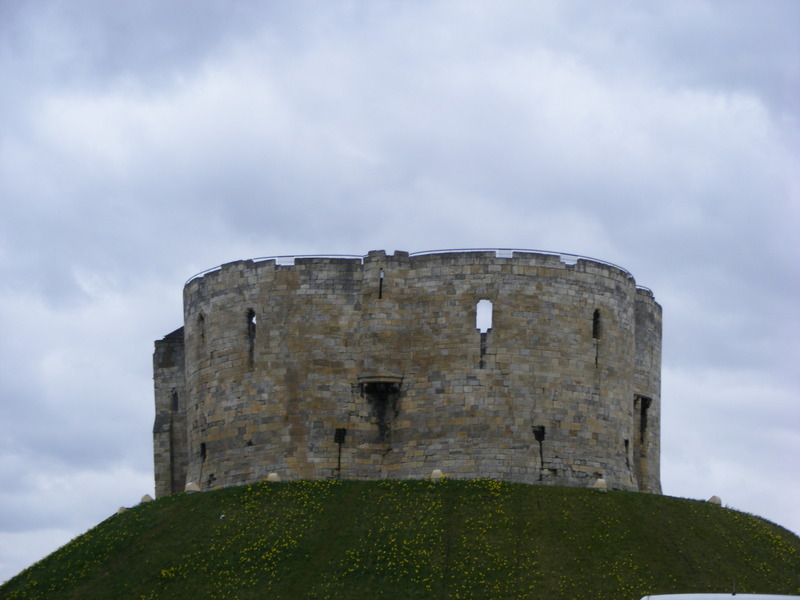 (Prisoners were held on the site of what is now the Castle Museum, York, adjacent to Clifford’s Tower). CREDIT: Nat Hunt. Over on the criminal side of the jails, knitting was sometimes smuggled out, to provide an added income, on release. Prisoners were often given yarn, technically the property of the Governor, to knit items whilst behind bars. In 1843, one enterprising non-debtor inmate from Morpeth Jail, Ellen McGurch (“a character well known to the turnkeys”) was found on her release, to be wearing a shift with stockings sewn to it and the hem doubled up. In the doubled-up hem, were stuffed a quantity of muffatees. Apparently, “….the female prisoners, instead of knitting the stockings with the yarn given to them, make muffatees and other articles… carry them out of the prison with them, and then dispose of them for money or drink…” [The Newcastle Journal, Saturday, January 28th, 1843].